Advocate Purple for Large Cats over 4kg. Advocate is an easy to use, monthly spot-on treatment that protects your cat from fleas, heartworm, intestinal worms and other nasty parasites. Advocate is one of the most broad spectrum parasite prevention products available for cats. It provides fast acting relief from fleas, that lasts for a whole month. It kills adult fleas and their larvae within 20 minutes of application to break the flea life cycle and prevent reinfestation. When applied monthly, Advocate also protects your cat from deadly heartworm disease. Although heartworm disease is less common in cats than dogs, there are no safe treatment options available, making prevention essential. Advocate controls lungworm and ear mites, as well as intestinal worms hookworm and roundworm. Lungworm is more prevalent in Australia than originally thought, a survey of stray cats found that 16% were infected. Cats contract lungworm from consuming animals infected with lungworm larvae, including slugs and mice. Left untreated lungworm results in damage to the lung tissue causing coughing, sneezing and difficulty breathing. 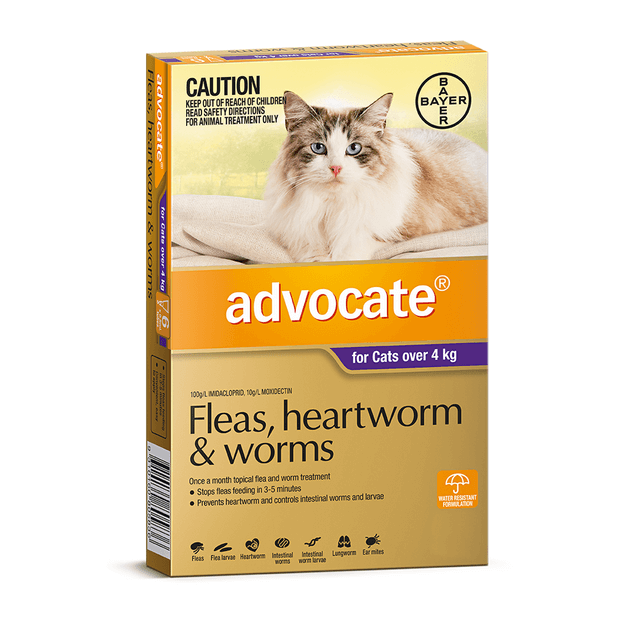 Advocate is one of the few products available to protect cats from lungworm. Safe for use in kittens from 9 weeks of age. The safety of Advocate has not been established in pregnant and lactating queens. Just looking for flea treatment? Try Advantage or Comfortis. Is your cat covered for tapeworm? Use Drontal or Profender every 3 months to make sure theyre covered. Learn more about Advocate and the entire Bayer range. Best price and very quick delivery. Easy to use on the cats. Great product.